Keith Williams Architects have exhibited the Novium Museum at the RIBA 66 Portland Place London W1B 1NR as part of the RIBA International Week exhibition. The Novium was chosen to join the exhibition organised by the RIBA Competitions Office to celebrate important projects that began life by the winning of an RIBA competition. Designed by Keith Williams Architects, after winning the 2007 RIBA design competition, the Novium is located in Tower Street in line sight of Chichester’s cathedral, in the city’s historic core. 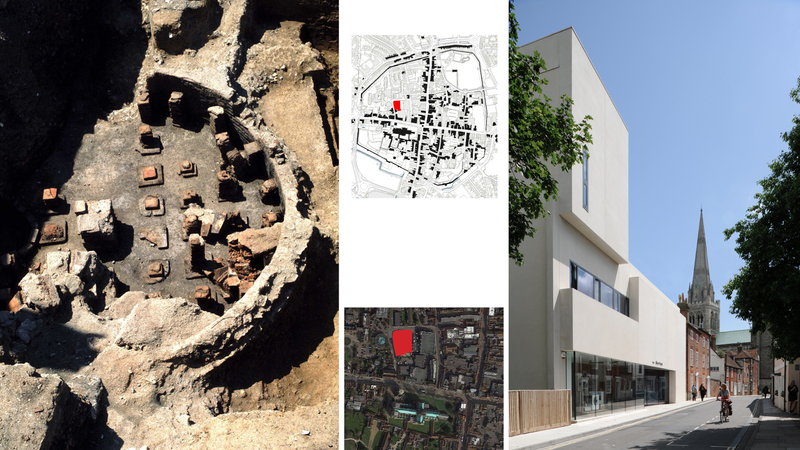 The new museum spans the extant remains of the hypocaust of the city’s Roman baths, which have been incorporated in situ into the main entrance gallery as a permanent exhibit and an intrinsic part of the museum. Galleries are laid out over a further two floors, which have been designed to be flexible allowing both permanent and temporary exhibition, and education spaces, restoration, research and staff areas. The museum has over 1,000 geological specimens (primarily fossils), 8,500 social history artefacts and items of ephemera, 3,600+ photographs and in excess of 300,000 archaeological finds, describing the story of Chichester District from geological times onwards. Elements of these are displayed in the galleries changing museological programme. The multi-award winning Novium became a Nationally Accredited Museum in 2014.